In cortical neurons, and probably in most vertebrate neurons, spikes recorded at the soma look “sharp”, ie, the voltage suddenly rises, unlike the more gradual increase seen in standard biophysical models (eg the Hodgkin-Huxley model of the squid giant axon). 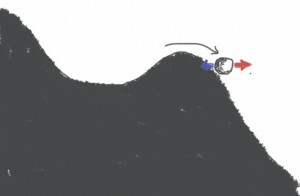 Recently I reviewed that phenomenon and current explanations. 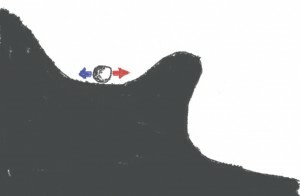 My own explanation, which I called the “compartmentalization of spike initiation”, is related to the fact that the main outward current at spike initiation (where “outward” is relative to the initiation site) is not the transmembrane K+ current but the axial current flowing between the axonal initiation site and the soma (see the original paper where I explain it). An important consequence is that the proportion of open Na+ channels is a discontinuous function of somatic voltage. In other words, spikes are initiated as in an integrate-and-fire model. Synaptic inputs can make the ball move to right (red, excitation) or to the left (blue, inhibition). 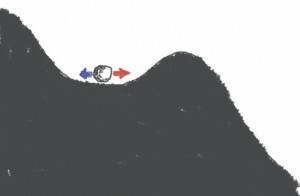 If the input moves the ball past the top of the hill, then the ball will continue going down the hill without any additional excitation: it's a spike. This is more or less the standard account of spike initiation. Note that if the ball is just past the hill, then it is possible to make it move back with an appropriate amount of inhibition. Sharpness here is represented by the steepness of the slope: a steeper slope will give faster spikes, and will also make it more difficult to go back once the hill has been passed. This occurs quickly, and importantly, there is a point after which there is no possible coming back. So the situation is qualitatively different from the standard account of spike initiation: it's not just that the slope is more or less steep, but rather there is a ravine. You will note that there is a short distance between the top of the hill and the ravine, where the ball is pushed towards the ravine but not irreversibly. This corresponds to the persistent sodium current near spike initiation, which comes from the axon. Ce contenu a été publié dans Blog, Spike initiation par admin. Mettez-le en favori avec son permalien.